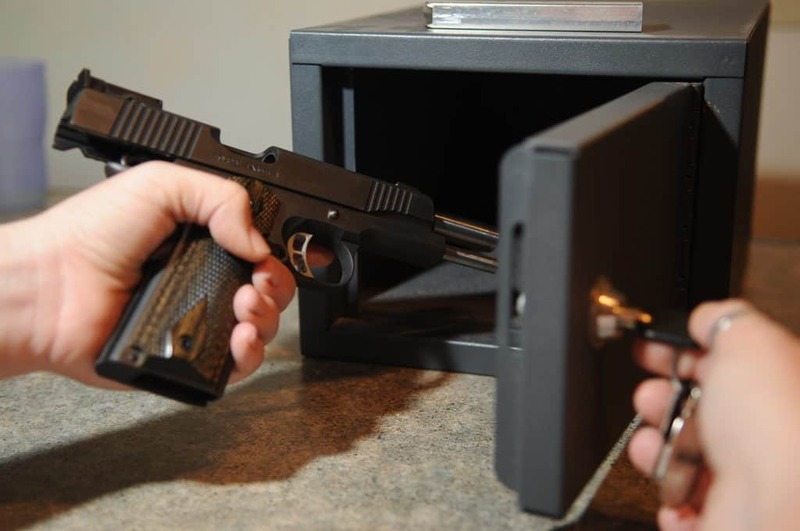 If you have a gun safe, you probably want to securely mount or install it somewhere. After all, a safe is no good if people can just walk off with it. We’ll share how to secure a safe without bolting it to the floor, so you can feel more secure about your gun storage. ​While bolting a safe to the floor is common, there are lots of reasons not to do this. If you are renting, you may not be allowed to bolt a safe to the floor. Another reason is that the floor itself is not suitable for bolting a safe to, making safe owners seek an alternative. Even if you own your home, you may be asking how to secure a safe without bolting it to the floor. If you have expensive hardwood floors you may not want to drill through them. Or, you may have a floor layout that just isn’t conducive to traditional methods of securing a safe. While it is best to bolt your safe to the floor, there are plenty of alternatives we will examine. Some are cheap and easy, and some can be expensive. But, the important thing is you’ll find ways to secure your safe from theft, even without bolting it to the floor. ​If you can bring your safe inside your home, somebody else can take it out. Even loaded down with guns and ammo, a couple of determined crooks with common moving tools could steal pretty much any safe. Since you don’t want this to happen, you need to secure your safe. There are lots of different safes to consider as well. Small safes need to be secured differently than large safes. Heavy safes offer false security that their weight alone is sufficient. Tall, lightweight safes can be easily hauled off on a hand truck by a determined crook. All this means securing your safe is very important. Now, we’ll look at common safes and ways to keep them from being stolen. Remember, there is no one size fits all solution. Consider your needs, your type of safe, the and if you own your own home or are renting. ​If you can’t bolt a safe to a floor, you can consider a few other ways to keep it secure. ​You can also consider bolting two large safes together. By doing this, you make the safes all but impossible to move without extensive labor or taking the two units apart. Remember, anything that makes it harder for a criminal to move your safe is a victory for you. ​Bolting large safes to a piece of heavy steel or a large pallet is also an option. Now, the safe cannot be moved through a door. But, these methods have some disadvantages we’ll discuss in a bit. Overall, it is probably the most popular alternative method. Store all your guns and valuables in one place! 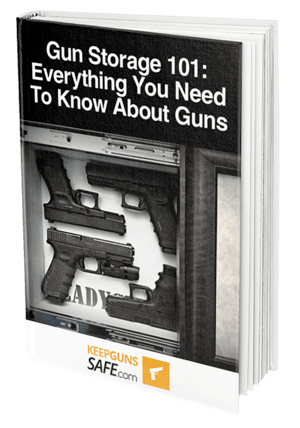 Find the best gun safe for you and your needs by checking out our guide. 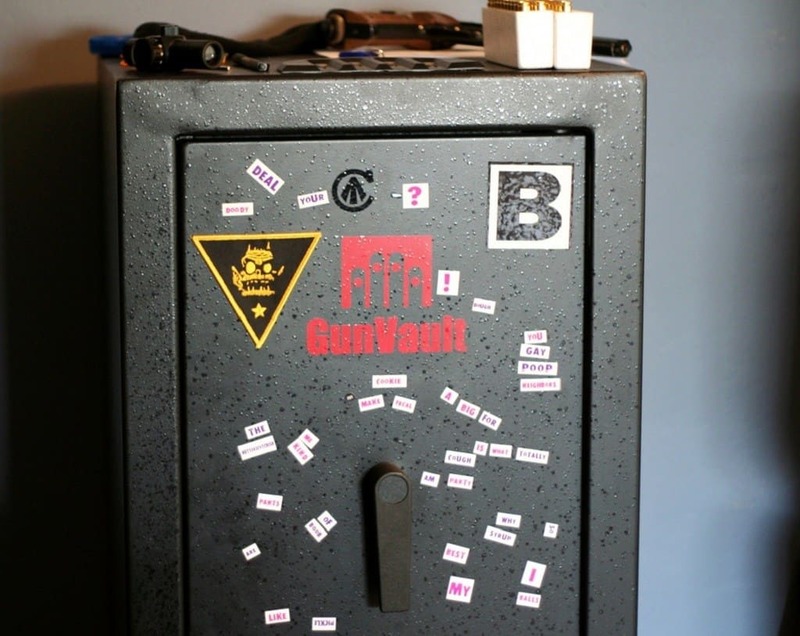 ​We looked at some common methods for securing a gun safe, but there are others as well. These useful methods may be appealing in certain circumstances, or when no other option is available. Consider them when circumstances warrant, or you have no other choices. ​You can glue a safe to a wooden or concrete floor with special high strength polymer glues. This is ideal for semi-permanent installations, or where you might own the building but choose not to drill holes in the floor. It is also great for garages. ​You can also make a safe too heavy to easily move. Several hundred pounds of sand or metal bars in the bottom of a safe can make moving it harder. After a point, specialized tools are needed to move that much dead weight, making it a less popular target. 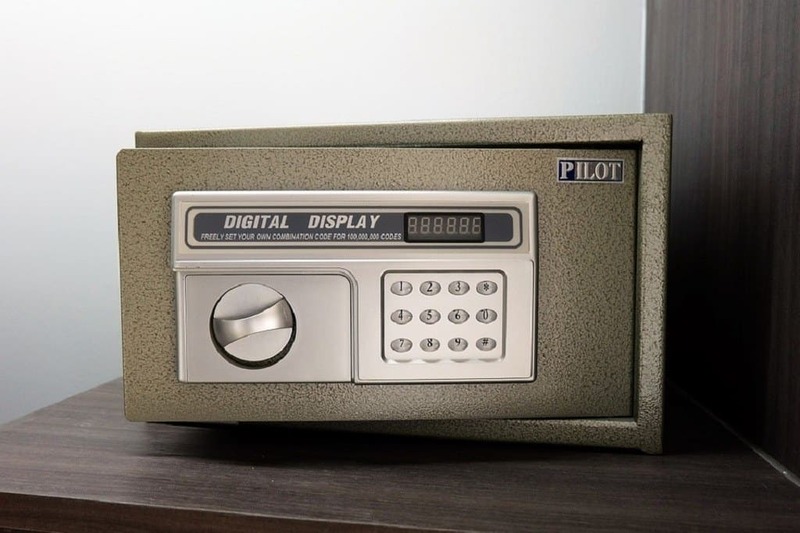 ​While a safe itself is a great tool for protecting things inside it, sometimes criminals like to take the entire safe to break into at their leisure. With time on their side, thieves can use powerful tools or torches to defeat a safe. They also don’t have to worry about getting caught inside buildings where they don’t belong. One common way safes are stolen is to simply load them up on moving equipment and haul them out of a residence. A safe that cannot be quickly loaded onto something is harder to steal. Also, very heavy safes will require special equipment and time, which are all enemies of the common burglar. Sometimes, really determined crooks who know, or think they have enough time, will bring extensive amounts of tools and a large truck if they think taking a safe is worth their trouble. In that case, your best protection will include burglar alarms. Locking your home is important, regardless of how you secure your safe or ​even a good gun case on the market. ​We’ve looked at various methods, and now we can get into some of them. Some are fairly self-explanatory. Others bear further examination. Remember, the main goal is to make taking your safe too difficult to bother with, so stealing it literally isn’t worth the time and energy. It is also a great idea to consider a safe with biometric technology that would have a fingerprint scanner to further prevent theft. If you can get away with it, bolting your safe to the wall is the next best thing to securing it to the floor. You must be sure you are bolting to studs, as running bolts into drywall won’t do you much good. You might also have to custom drill holes in your safe to align with the studs in your wall. Be sure to use sturdy lag screws. You’ll want at least a half-dozen fasteners, depending on the size of your safe. Carefully consider the size and configuration of your safe when deciding how to attach it to your wall. ​Attach your safe to a large piece of heavy steel or a pallet. This makes it impossible to move your safe through your door. You need to be aware that pallets can be cut or broken away, so a piece of heavy sheet metal is probably your best bet. Also make sure you have a gun lock attached to keep ​criminals from firing them should your safe get in to the wrong hands. ​​Glue it down to your floor if you own the building. There are a number of high strength epoxies on the market that can secure your safe. As a bonus, when properly glued down, it can take days of careful work with tools to eventually break the safe free. ​​You can make your safe too heavy to move by simply filling the bottom with heavy weights. This can be as simple as sandbags or lead bars, or as complex as poured concrete. Avoid filling it with items that have moisture in them that might affect your guns and the safe. The goal here is to make your safe far too heavy to move by unauthorized persons. ​​Bolt two large safes together to make them impossible to take out of a door. You can also fasten and hide small safes inside or on furniture. Or you can glue down a small safe to the top of a closet shelf, relying on both physical security and secrecy for protection. ​If you want to secure a safe without bolting it to the floor, there are viable options. Ranging from the simple, to the complicated, you can stop criminals from stealing your safe with a few simple tricks. What is great is that none of these methods cost much money, making them ideal for the budget-minded safe owner. Each of these options depends on the size and type of the safe. Large free-standing safes or cabinets require a different approach than very small safes. You can also improve your safe security by buying physically heavy safes which are difficult to move without tools and special effort. ​Securing a safe in non-traditional ways is easy. Once you’ve chosen your safe, and picked where you want to put it, you are halfway there. Think about the pros and cons of different methods of securing your safe and how they will affect you and your home. There is no need to make this a complicated affair. After all, simplicity has a value all its own. None of these approaches are difficult. In fact, you can combine several approaches to make your safe even more secure and difficult to move. The reality is, not being able to bolt your safe to the floor isn’t a big deal. In fact, even if you have that choice, after reading this article you might not want to! As you can see, the sky is the limit when it comes to securing your safe. The best part is, there is no right or wrong way to accomplish this.